I was going through my blog, reviewing what I had accomplished this year, and realized I failed to blog about three finishes! First up is is Lo-Lo, a sample I made for market. This quilt is deceivingly easy to piece. 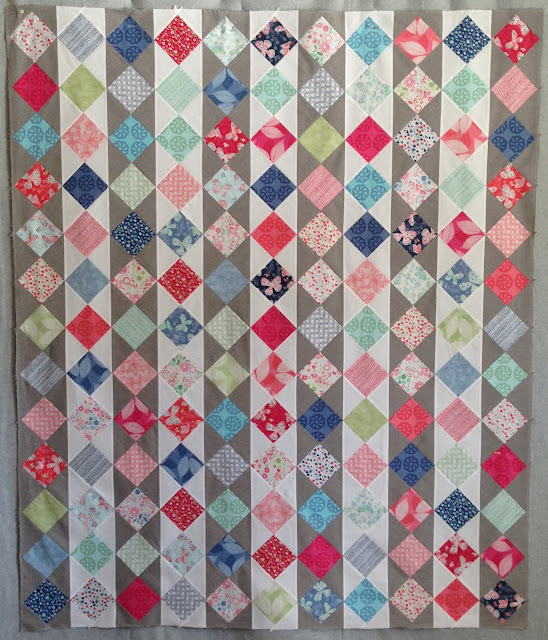 If you like making half square triangle units (which I do, I make them big then trim them to size), then you'll enjoy working on this quilt. The print fabric is a layer cake of Kate Spain Aria for Moda, the dark background fabric is a Pure and Natural woven called Charcoal also by Moda. It finished at 62" x 73"
It finished at 52" x 52"
It has approximately 184 pieces. 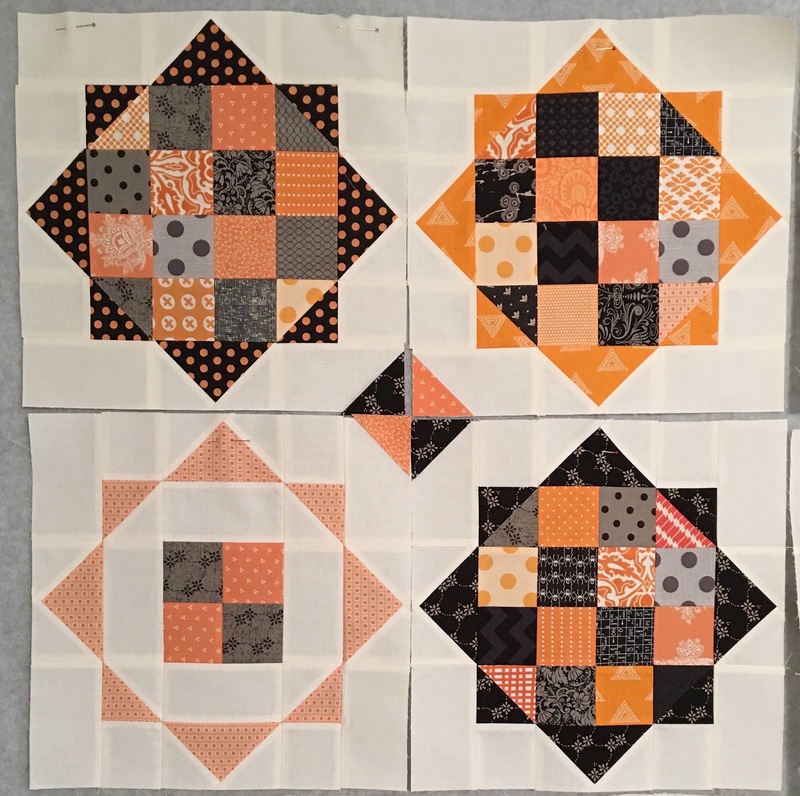 The first two quilts, Lo-Lo and Glad Tidings, I didn't blog about when I finished them because they were to be introduced at market, not by my blog, lol. Then market came and went and I forgot all about them! The next top I didn't blog about because it was such a huge disappointment that I wanted to forget about it. But I need to stay true to my list. Most of my quilts are good, some are really good, but every now and then I come up with a stinker! Which is what I should probably name this quilt. It got off to a great start, I bought one layer cake and two charm packs of Primitive Muslin by Primitive Gatherings for Moda. 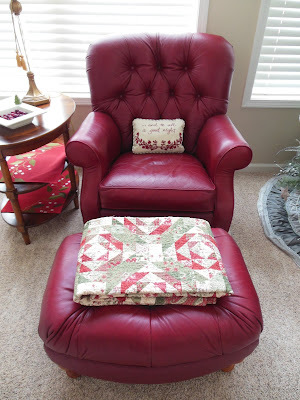 I loved the rich colors but it was the feel of the fabric that really got my attention. 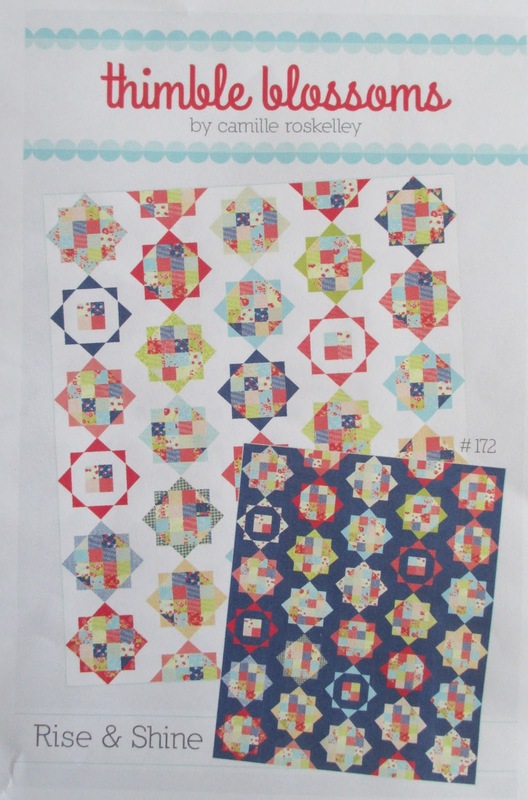 I figured I could easily whip up a soft and warm quilt for Mr. Cupcake using these precuts. And I guess technically I did, it was easy, it's soft, and if it were quilted it would probably be warm, but that doesn't change the fact that it's ugly! 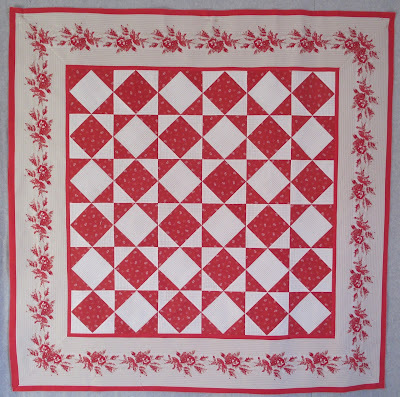 It's so hard to make quilts for guys, I thought I had come up with a great plan. The look on my husband's face when I showed it to him pretty much summed up my opinion of the top too. I'll give myself points for efficiently using the fabric, but the colors just don't all go together so good, maybe just using two of the colors would make for a more pleasing top. I've decided to turn this one ugly top into two ugly tops, get them quilted, then use them as covers for Cooper's bed. It finished at 63" x 81"
It has approximately 126 pieces. 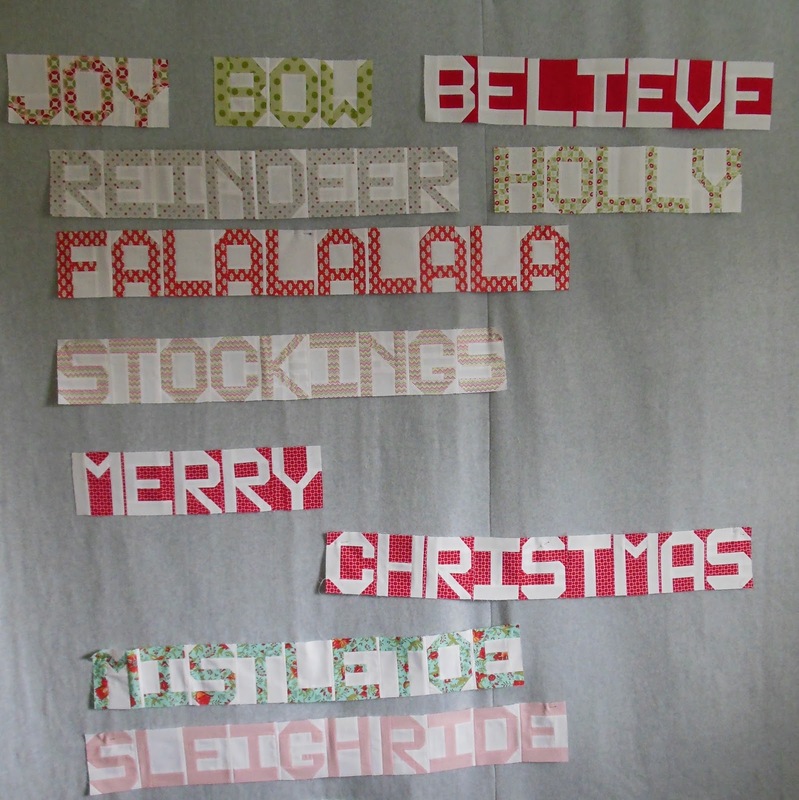 I came up with a name for my Christmas word quilt, Spelling the Spirit of Christmas! Last I checked I've answered all the questions in the comments section. Next up, I'll review 2015, I had a wonderful year, even with that one ugly quilt thrown in, then it's on to my 2016 goals. Hope you'll stop back by! Just in the "Nick" of Time . . . . . I've finished my Spell it with Moda for Christmas top. I started this project last year, but as soon as Christmas was over I wasn't in the mood to spell any more Christmas words so I packed it up. I'm so happy I won't be packing it up again this year! 28 words made the cut, my list had several more that I didn't use, but I think this is a nice size. 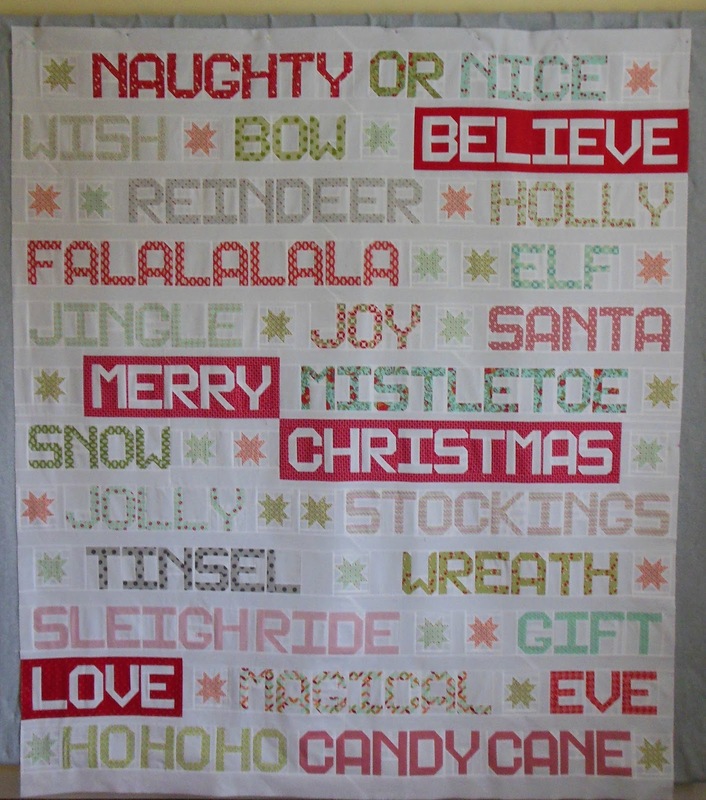 I didn't use any Christmas themed fabric, but I don't think you would notice, I think it feels like a Christmas quilt before you even start reading the words. It finished at 78" x 91"
The vast majority of the fabric is by Bonnie and Camille for Moda. It has approximately 2,079 pieces. 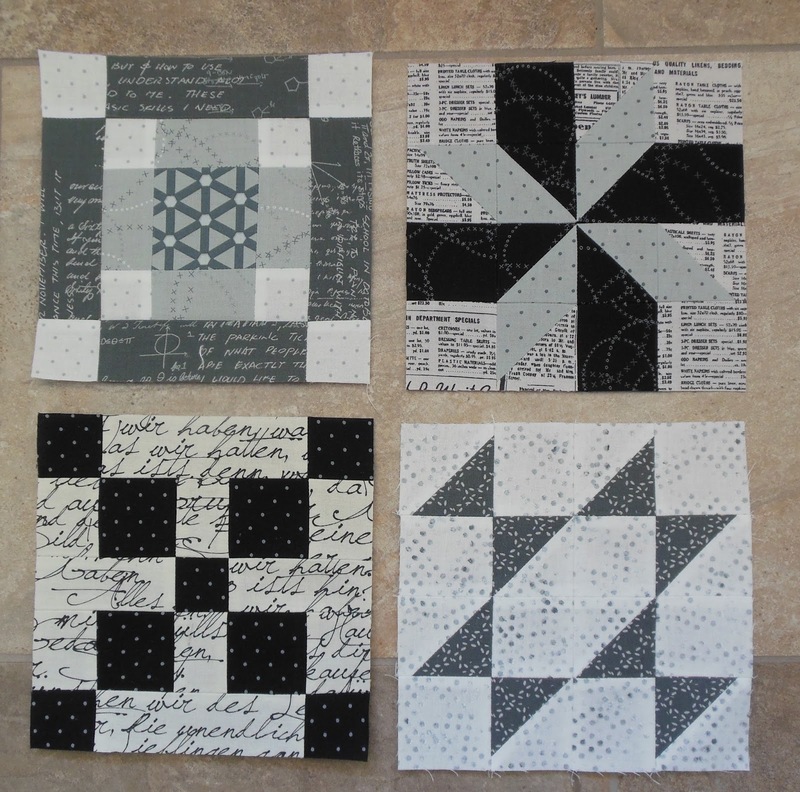 The Moda blocks finish at 8" x 10", I cut them down by half to get blocks that finish at 4" x 5". I liked the patterns for each letter, I didn't change a one. The instructions were very easy to follow. Several folks have asked if I'm going to create a pattern, I am not. That sounds like work, and this is my hobby not my job. 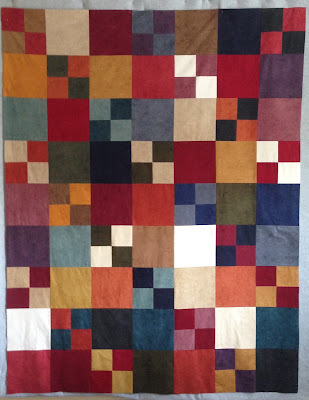 But I'm happy to share with you all the specifics of my quilt, feel free to use my finish as a starting point for your project or go ahead and copy the whole thing, I consider that a compliment. So here is a crude layout of my words. 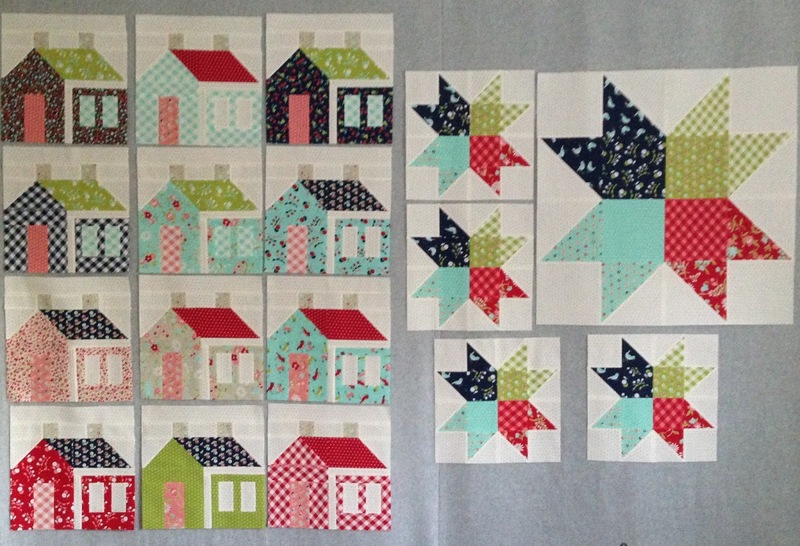 I changed some of the rows as I pieced them. My main goal was to not have the words all line up perfectly, I wanted it to have a random feel. 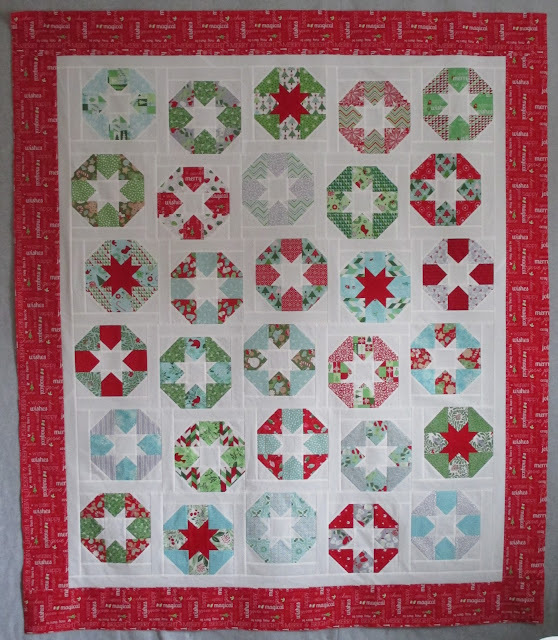 As I pieced each row I added extra fabric to each end, then moved it back and forth until I was pleased with how the words and stars were positioned. The sashing between the rows finishes at 2 inches. The sashing between the letters of each word finish at 1/4 inch. The fabric between the words and around the stars started with strips that were 2 1/2 inches wide. Sometimes I trimmed them to get a better look. The stars finish at 4 inches. 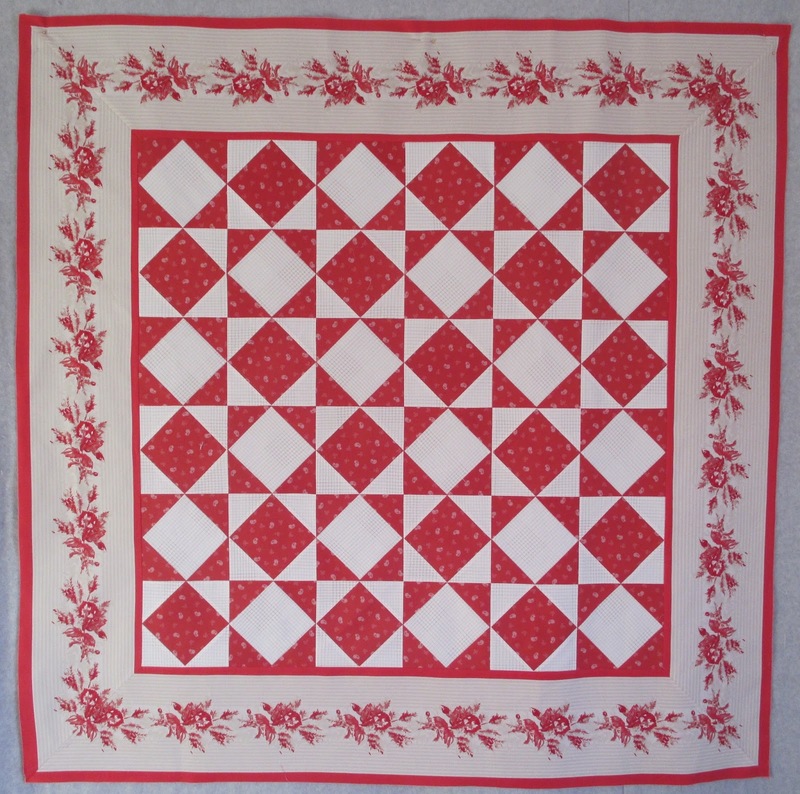 To get a 4 inch star you need a 2 1/2 center bock, four 1 1/2" x 2 1/2" geese and four corner 1 1/2 inch squares. I can't think of anything to share, but don't hesitate to leave any questions you may have in the comments section. I'll answer any questions in the comments section so everyone can benefit. A couple of days ago I woke up in the night thinking that I had not included Santa in my project. And it bothered me, why had I left out Santa? When I got I up that morning I checked my top, I hadn't left out Santa! You know it's time to wrap up a project when you start dreaming about it. Best wishes to your family for a wonderful holiday season. 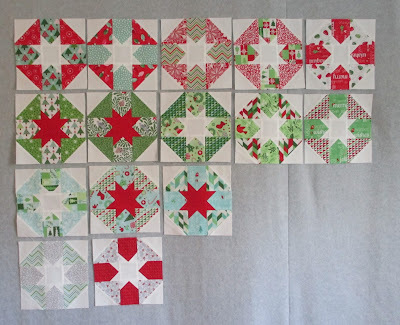 Over the years I've pieced 20 Christmas quilts. 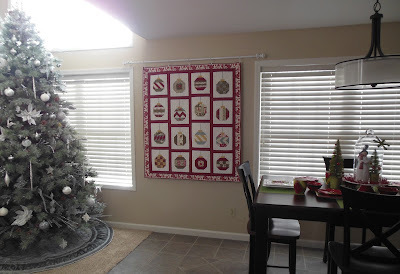 Several live with friends and family but quite a few still live with me, I love Christmas quilts and enjoy decorating the house with them. 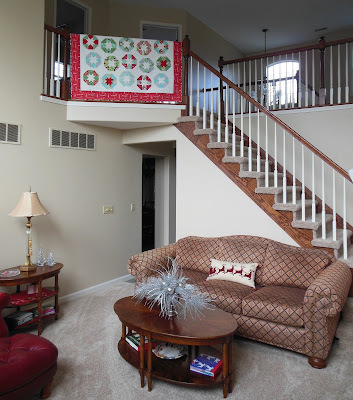 I finished decorating the house this week and here is a little parade of the quilts we're enjoying this holiday season. Starry Eyed, LQ#78, is on the guest bed. Christmas in the City, LQ#79, is on the guest room wall. Toulouse, LQ#54, is folded and ready for snuggling. Oh Christmas Tree, LQ#53, is hanging in the family room. Here's Amaryllis, LQ# 85, in the living room. Round and Round, LQ#121, is on my bed. Olde World Stars, LQ#67, is in the family room. Red, White and Wonderful, LQ#64, is on a bench in the loft office. Vintage Holiday, LQ100, has been up since the day after Thanksgiving! This is Christmas Lollies, LQ#168, it's not staying long, it's a gift for a friend, but since we don't exchange gifts until the 18th I figured this was a good storage place! 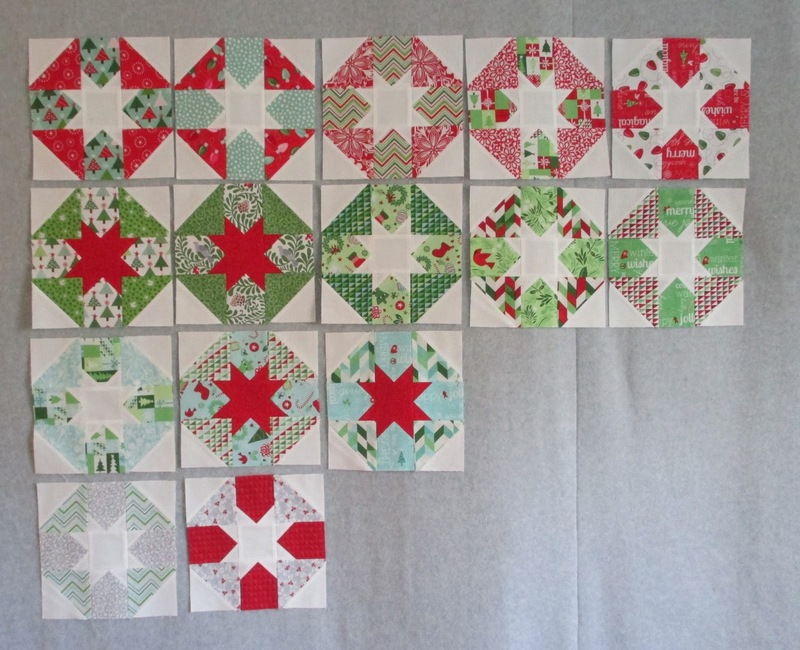 Only 15 more days until Christmas, not much time to enjoy all these quilts, they may be up in January! Do you remember this project from last December? I got a late start on making a Christmas Spell It quilt last year and packed it up the first of January, not quite done. 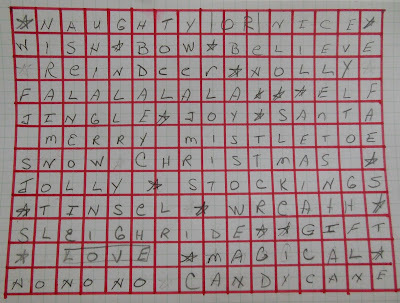 I got it back out the first of this month and am getting back into the swing of making more Christmas words. 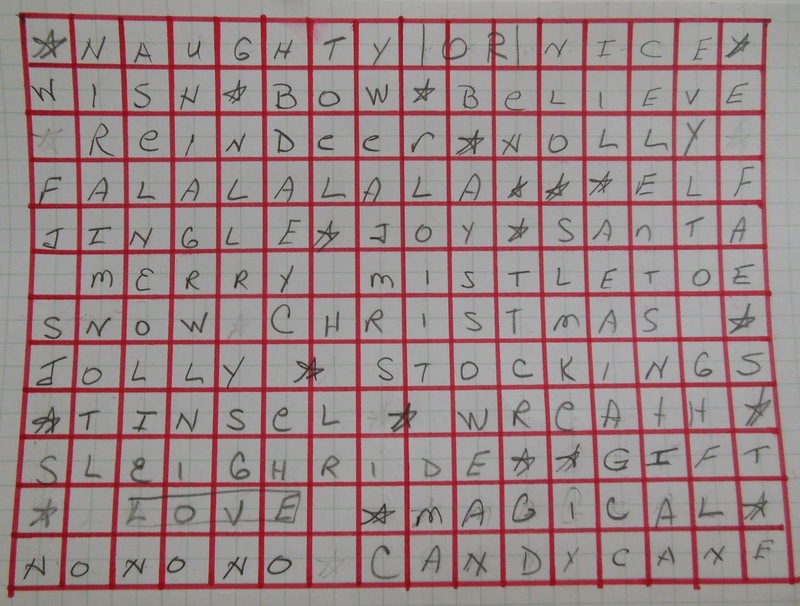 I have a long list of Christmas words to pick from and am basically just working on a row at a time, no big plan, I don't even know for sure how I'm going to put it all together. 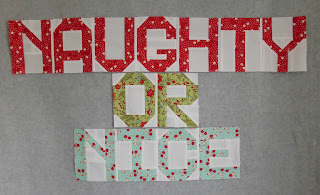 But that's OK, this time of year I'm just happy to spend any time in my sewing room sewing, and piecing these words is fun and easy. And just to add to the fun I'm listening to Christmas music too. It IS the most wonderful time of the year! Are you ready for a new Snapshots block? It's that time again!! Plus it's the last block, I can't believe we're at the end! 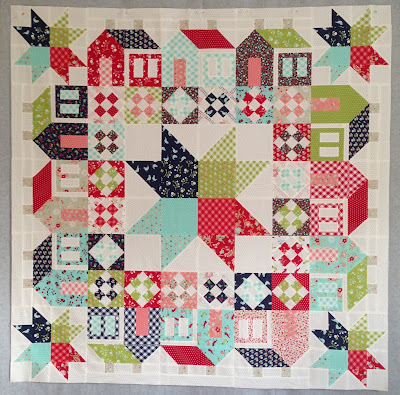 This month's block is A Walk in the Park, my latest favorite. This block is very easy and goes together quickly. I made my block exactly like the pattern except for the beverage in the glass. I am thrilled that the FQS has already surpassed it's initial goal of raising $10,000 for St. Jude Children's Research Hospital and its new goal of $20,000. The last time I checked the amount raised was over $36,359, how great is that! As a reminder, the monthly patterns are a free download, a donation is up to you, the suggested donation is $5. Here is a link to the pattern, instructional video, donation page, and everything else you need to know. (click here) The backing and finishing directions are also available. Here are a few more folks participating in the sew along, be sure to check out their blocks. 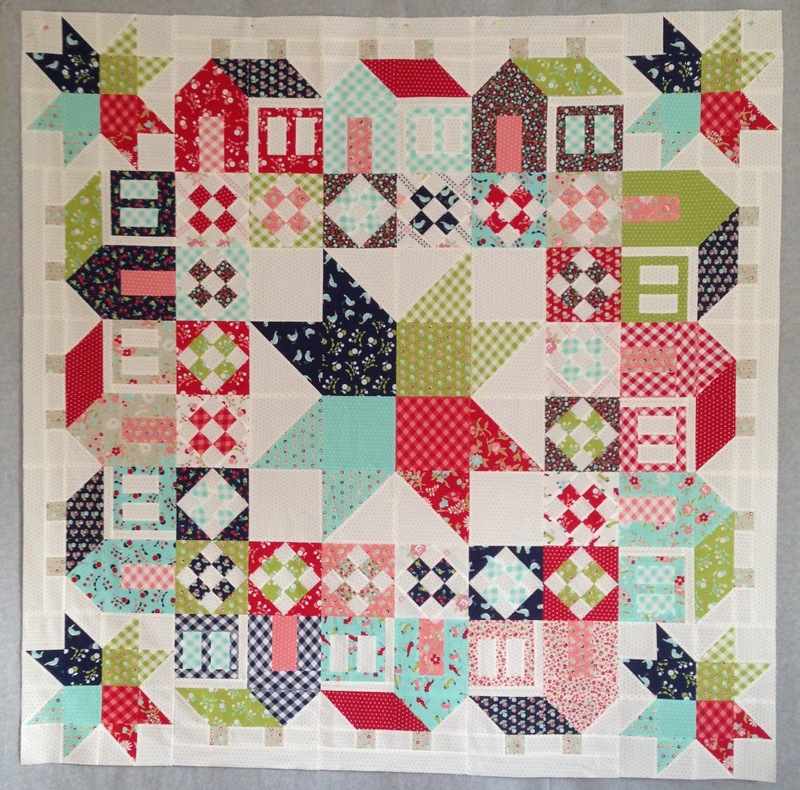 Additionally, the Fat Quarter Shop is auctioning off 3 finished Snapshot quilts with all the proceeds also going to St. Jude Children's Hospital. 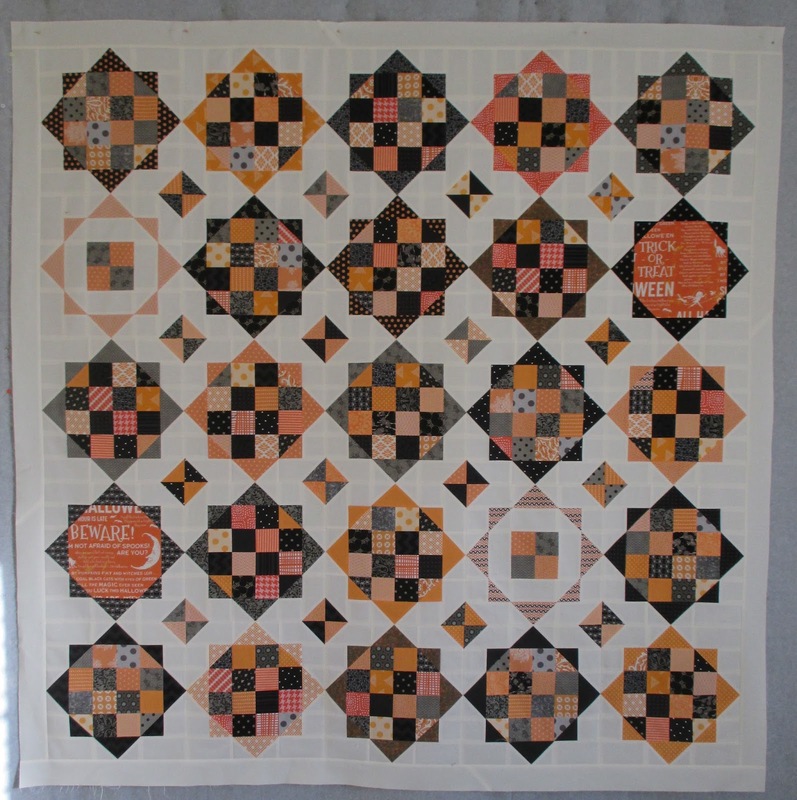 One quilt is made by the Fat Quarter Shop, another by Anne Sutton, and one by Pat Sloan. All three quilts have a different look, and all are amazing. For auction details click here. Thanks for following along, I've enjoyed each block and can hardly wait to have my top all done, hopefully by the first of the year! 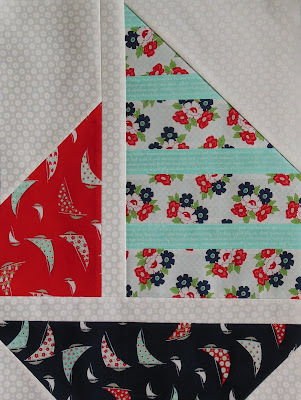 This month's block is Sail Away, my latest favorite. 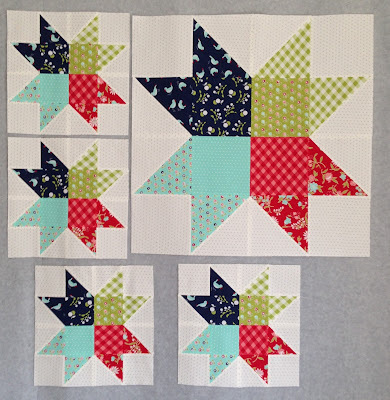 This block is very easy and goes together quickly, there are only 16 pieces. It took me a little over a hour start to finish. I made my block exactly like the pattern, I thought it was perfect as is. I am thrilled that the FQS has already surpassed it's initial goal of raising $10,000 for St. Jude Children's Research Hospital and its new goal of $20,000. The last time I checked the amount raised was over $34,900, how great is that! As a reminder, the monthly patterns are a free download, a donation is up to you, the suggested donation is $5. Here is a link to the pattern, instructional video, donation page, and everything else you need to know. (click here) The backing and finishing directions are also available. Here are a few more folks participating in the sew along, be sure to check out their sail boats. 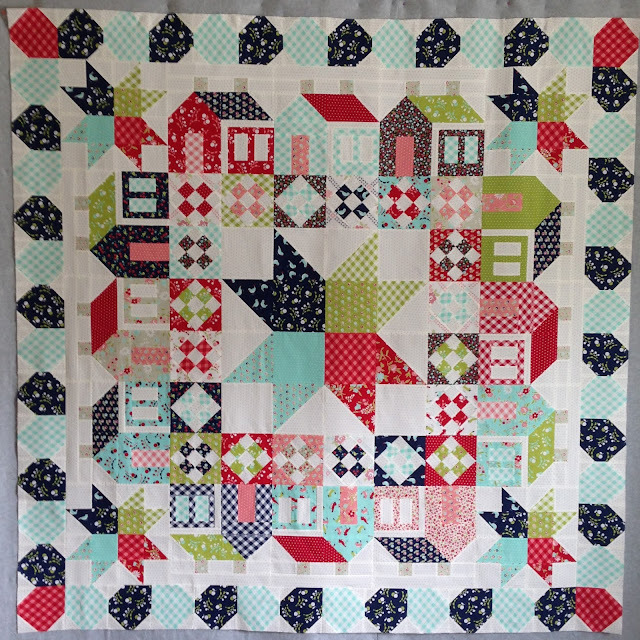 I was asked to make a shop sample of Camille's pattern Summerville using Bonnie and Camille's latest line Vintage Picnic. It gave me a week of happy sewing in my sewing room. and the final border. And just like that I was done. The pattern cover says this is a "Sweet & Simple" pattern, I could not agree more. Plus it was fun, and made me happy the whole time I worked on it. 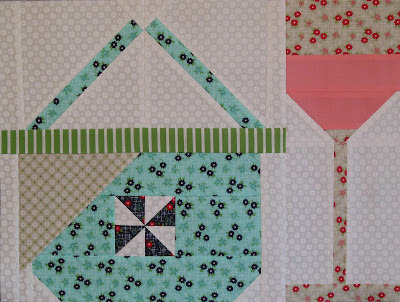 I think it was a combination of the wonderful fabric and easy piecing. The bird fabric was my favorite. I wasn't sure Bonnie and Camille could design a family of fabric I liked better than Happy Go Lucky, but they did. I think this pattern would also look great if you used holiday themed fabric, like Halloween or Christmas, or even went totally scrappy. Which is a good thing, Vintage Picnic won't be hitting stores until February, 2016. And has approximately 876 pieces. It sure doesn't take long to finish a quilt top when half the blocks are already pieced. Although I enjoyed making the Lollies blocks so much I was sort of sad when I made the last one. This is a pattern I would enjoy making again, and maybe not in holiday themed fabric, although I think this pattern is very well suited for Christmas fabric. It finished at 64" x 74"
It has approximately 698 pieces. 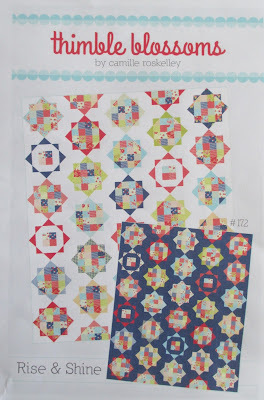 The Lollies pattern is available here. Have you been drooling over all social media pictures of fall market? Black Tie Affair by Basic Grey, Spooky Delight by Anne Sutton of Bunny Hill Designs, and Carkai by Carolyn Friedlander are lines of fabric that are on the top of my wish list. Now we just have to wait for it to show up in stores, which seems to take forever. For the first time I was able to watch some great Market broadcasts on Periscope. Did you give that a try? It was almost like being there, except I couldn't buy anything at that Sample Spree! And I can't let the day go by without saying happy birthday to someone who spends almost as much time in my sewing room as I do. This is Cooper when we brought him home. I should maybe get him a bigger bed for his birthday. Are you sewing this weekend? I'm hoping I am!! Over Memorial Day weekend a friend and I had a Lollies weekend sew-along. I stopped working on Short Line and pieced 15 blocks. Then the weekend was over and I packed up my Lollies and went back to Short Line, and forgot about Lollies. 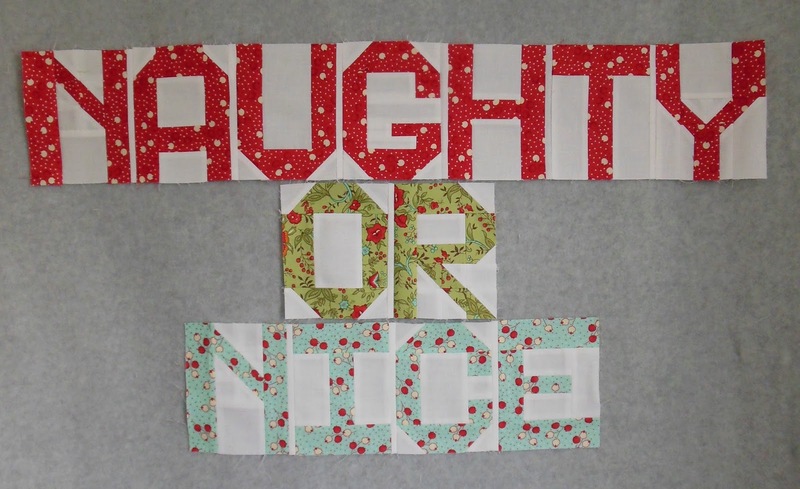 I've decided I better finish this quilt quickly if I want to be using it for this Christmas. 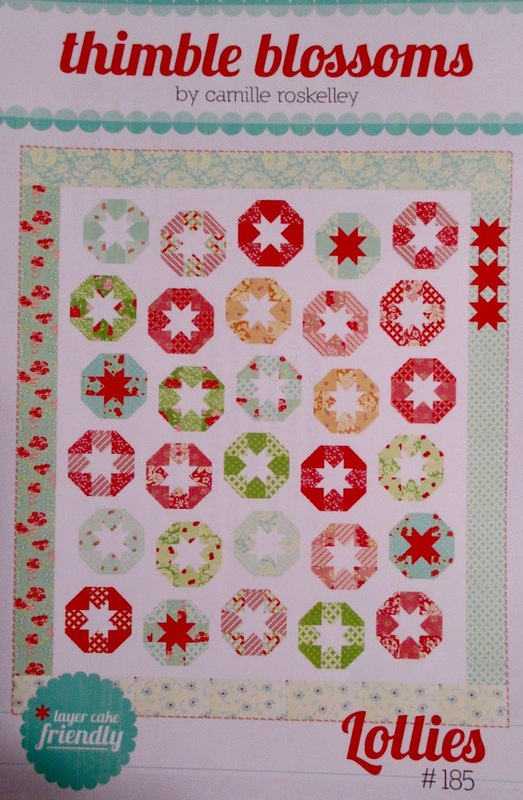 I'm using Kate Spain Christmas fabric for my Lollies. The pattern is by Camille Roskelley for Thimbleblossoms. 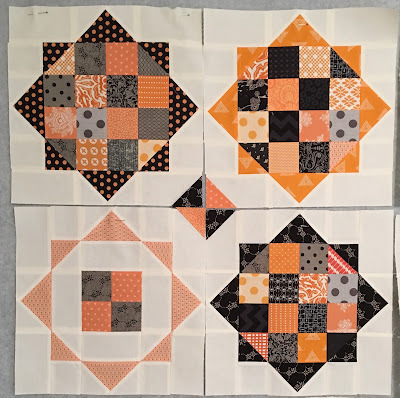 I don't stop projects before I finish them very often, but it sure is nice restarting this project with half the blocks pieced!